At the beginning of the 19th century most people's clothes were made by hand - either by tailors and dressmakers or at home. By the end of the century, however, mass production of items such shirts and trousers meant that ready-made clothes became cheaper. 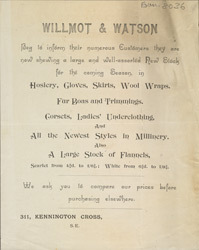 Large department stores and clothiers like Wilmot & Wilson’s stocked almost everything from hosiery and underwear to overcoats and sporting jackets.